By the time the provincial government announced the mega-hydroelectric project of the James Bay in 1971, the subsidence way of life that had sustained the Cree was much altered. In the late 1950s and beginning of 1960s, industrialization in the southern regions began to have a significant impact on the Cree, the animal populations on which they depended, and the ecosystems in the region. Expanding road and railroad networks and intensive natural resource development such as forestry and mining brought new non-Aboriginal people in the area. Towns such as Val d’Or and Chibougameau were incorporated at the time disrupting many hunting territories. Road traffic, chemical spraying and pollution from mine waste and pulp and paper mills forced the Cree to reduce fish consumption and change hunting patterns as well as a imposed a semi-forced transition to a wage economy. By the time the provincial government announced the mega-hydroelectric project of the James Bay in 1971, the subsidence way of life that had sustained the Cree was much altered. Nevertheless, young Cree leaders schooled in the south and backed by the older hunters proved to be a force to be reckoned with. The work started in 1971 was done neither with regard to nor in consultation with the Cree communities in the region. A meeting of the leaders from each Cree community was held to discuss the project and the foreseeable impacts on the Cree way of life. The young Waskaganish Chief Billy Diamond and his father, former Chief Malcolm Diamond took leadership in organizing the Cree response to the James Bay Project. 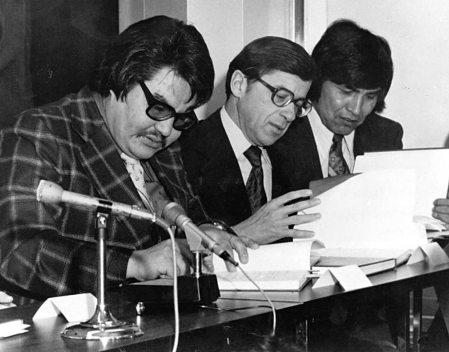 In 1972, anticipating great impacts on their livelihood, the Cree and Inuit sought an injunction from the Superior Court of Quebec, “the longest temporary injunction hearing in Canadian history” (Feit, 1995). Six months later, the Malouf Decision suspended work on the project until prior agreement from the Crees and Inuit would be gained. 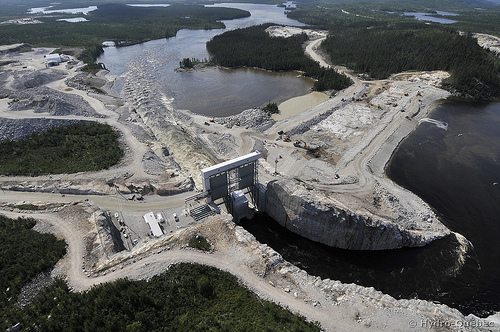 Nonetheless, the construction work proceeded a week later when the Quebec Court of Appeal suspended the injunction on grounds that the public interest takes precedence over the interests of a minority. As a result of these legal confrontations the Cree formed, in 1974, the Grand Council of the Crees (GCC), their first and central political body. Billy Diamond became the first Grand Chief of the Cree. In 1975 negotiations between the Cree and the Inuit and the provincial and federal governments, resulted in the first northern comprehensive land claim to be settled in Canada, the James Bay Northern Quebec Agreement (JBNQA). "The Cree People were very reluctant to sign an Agreement in Principle. However, after many meetings and many hours of meetings, the Grand Council of the Crees has received a mandate to sign an Agreement in Principle with the Quebec Government.... We feel, as Cree People, that by coming to an Agreement in Principle, that it is the best way to see that our rights and that our land are protected as much as possible from white man's intrusion and white man's use. We have always said that we wanted to maintain our way of life. We have always said that we want to pass the land on to our children.... We believe that even though we practised the traditional way of life, the aboriginal way of life, we believe this agreement supports and strengthens the hunting, fishing and trapping rights in/over all of the territory, and restricts non-Native activity in that area. By the proposed agreement, we feel we have removed the worst effects of the Project to our way of life and the Cree People.... I hope you can all understand our feelings, that it has been a tough fight, and our people are still very much opposed to the project, but they realize that they must share the resources. That is why we have come to a decision to sign an Agreement in Principle with the Quebec Government” (Diamond, 1977 quoted in Feit, 1995)." Morantz, Tobi. The White Man's Gonna Getcha: The Colonial Challenge to the Crees in Quebec. McGill-Queen's Native and Northern Series #30. Montreal: McGill-Queen's University Press, 2002. Grand Council of the Crees. I dream of Yesterday and Tomorrow: A celebration of the James Bay Crees. Kemptville, ON: The Golden Dog Press, 2002.